Though the terms are often used interchangeably, there are differences between climate change and global warming. 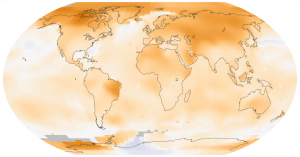 The term global warming is used to refer to a general rise in the global average temperature. Climate change, on the other hand, refers to the local climate changes in different areas, particularly when the numbers are inspected on a timeline. As such, climate change may result from global warming, and the subsequent changes to things such as water cycles, ice covers and land covers. It is possible for climate change to also occur as a result of natural shifts in sunlight, mountain growths and continental movements over an extended period of time. In the strictest definitions, global warming only refers to the increases occurring in global average temperatures. As of 2015, the global average temperature was found to be 59 degrees Fahrenheit. Over the next several years, environmentalists project that the global average temperature may increase by as much as seven degrees. Scientists understand that man-made increases in greenhouse gases are caused by the burning of fossil fuels, which expedite this global warming and result in a warmer global temperature level. However, though it is accepted that general global temperature increases are occurring, the amount is not the same for every single location on the planet. Through this understanding, the concept of climate change comes in. Climate change is used to describe the way specific climates in different sections of the world change with time. Though this effect typically occurs as a result of global average temperature increases, there are other factors that may contribute to localized climate changes. Things such as changes in global weather patterns may also affect conditions such as precipitation averages and general extremes. Man-made factors may also play a role in the changing processes, such as rapid industrialization in a region without the appropriate waste management plan. In such a way, climate anomalies may frequently be attributed to man-made changes. For information on insulation and environmentally friendly building solutions, contact USI online to find a branch near you and get a free quote. USI believes in excellence in every step of the process and ensures timely completion and quality of service, time after time. ← How do I conduct an energy audit on my home?